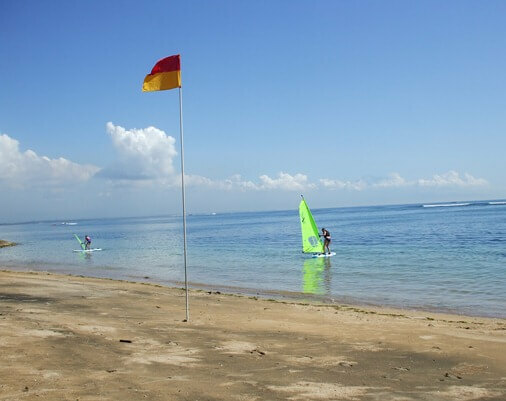 Pantai Samuh Nusa Dua or Samuh Beach is a lovely white sandy beach, set amidst a peaceful environment with panoramic views of the blue sea and sunrise. This coast is located in Nusa Dua, Badung Regency, Bali. This coast is adjacent to the Tanjung Benoa Beach, Nusa Dua Beach, Mengiat Beach and Geger Beach. The beach is easily accessible by car and only 20 minutes from Ngurah Rai International Airport through the Bali Mandara Toll Road. Samuh Beach can be accessed from Nusa Dua Beach. In addition there is also access from Jalan Pratama (to Tanjung Benoa), but not too wide. There are souvenir shops and cafes along this entrance. At any given time, this beach serves as a place for Melasti ceremony, Nyegara Gunung ceremony and Nyekah ceremony. Samuh Beach Bali is also home to the preservation of coral reefs, coastal ecosystems, marine life and reef fish. This coast is a flat type, sandy white and well groomed. The shallow water condition, relatively quiet and uncrowded is very suitable for swimming, relaxing and sun bathing. In addition to the beach, visitors can also try several water sports such as jet skiing, banana boat, flying fish, windsurfing, etc.